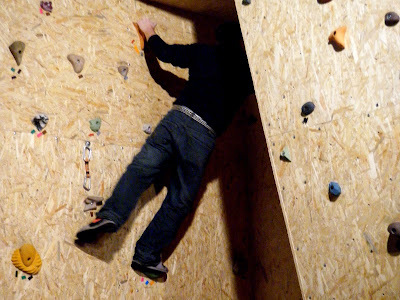 This is not a picture of me executing some fine overhang-conquering free climb. I’m in the picture below, staring up into a dark dead-end. 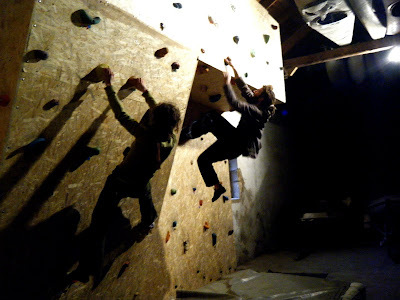 But I was climbing and, as my fingers, hands and arms testify as I type, this evening was an upper-body workout unlike any I’ve had in a while. A week or so back – which could mean anything up to a month ago! – a co-worker mentioned they had discovered a neighbour was involved in a new indoor climbing venture in Mostar. One thing led to another and a few of us went ago to check the venue out and ask about bring a group of young people along from Klub Novi Most. This seemed like the first request of its kind as the owners had to go away a work out what price they’d charge for a one-off group visit. Instead, let’s celebrate a new facility in Mostar, one that I’m sure we’ll make use of again. And with that in mind perhaps I should drag the exercise regime I dreamed up from the realm of good intentions into the reality of my daily schedule!